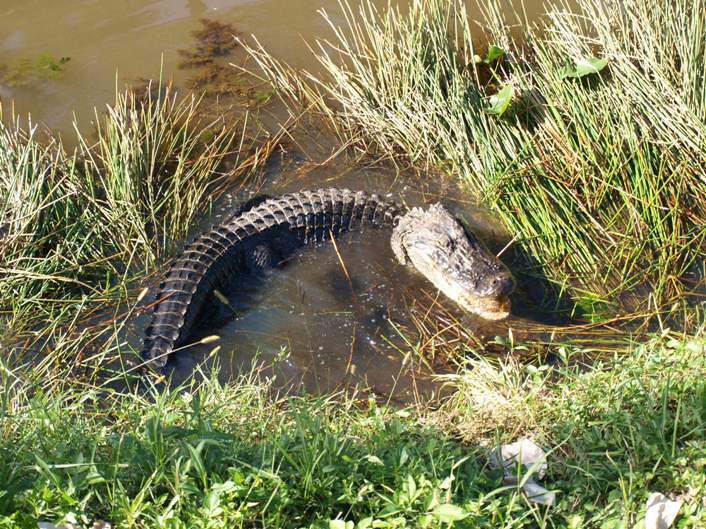 That gator up there? I got up close and personal with her. Well, nearly. There are three of them that live in the water that surrounds part of the West Palm Beach track. The groundspeople take care of them, making sure they don't get hit by vehicles or escape the grounds. Apparently, if they wander too far off, the state comes in and saves them. By killing them. Louis, the guy who took me to see her, clapped and called to her and fed her. She was nasty and moody. That's how I know she was a she. Thanks for all the cold weather here at home. Brrrr. Spent all of Tuesday at the Raceway speeding around in a complete lineup of AMG's. That's fancypants (well, fancierpants) Mercedes. 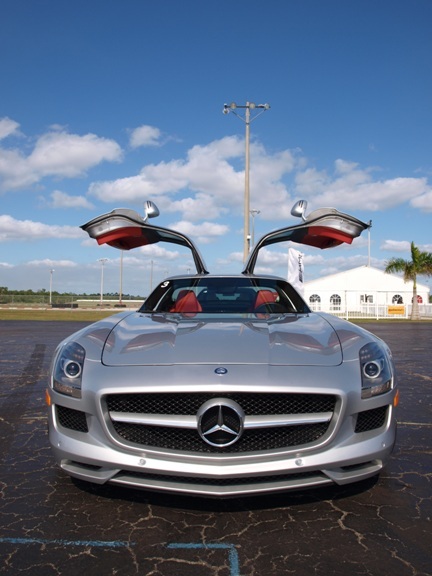 Yes, I got to drive a couple of the SLS's with the gullwings, as well as a roadster. Oh, my. More later. Lots of laundry; I kept walking in the ocean in my jeans, soaking them all the way up. Almost as much fun as the cars. They did a good job with the front end of the car.Will be strictly a toy for the rich, unfortunately. The crocodile reminds me of that youtube meme where the hapless bungee jumper reaches the end of his line and had his head removed by a hungry croc. Loved that video. (I know I have dark humor) Is the article on the Benz going to give us some hard data or is the Star running a Jim Kenzie feature for that angle? It'll be interesting to read your impression of it. Come on, guys. You know I don't do car reviews. With people able to dial up their own press kits like *that*, there's no point regurgitating info from there. I wouldn't insult readers by pretending otherwise. For me? I hop in, turn the key, and experience them the way most of us do. Cars are for everyone. Though I will admit that one in the pic is only for a select few. I just find it a shame that so few of those who can afford it will ever really experience it. Track days, people! If you can afford these beauties, take advantage of programs where you can really drive them! And, the alligator was seriously cool. When I look at that mercedes photo, all I can think of is "Rayman" (well, more specifically, "Rayman II"). It's the gullwings - they just look like little floppy ears to me. The alligator? Absolutely Fangnab (at least the word cipher seems to share my warped perceptions; how afraid should I be...?). Reading those reviews was interesting.